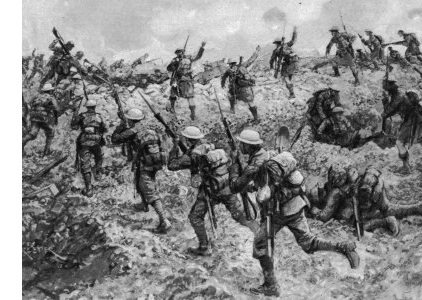 World War I (1914-1918) - Throughout most of history, war had routinely been considered an instrument by which problems between two or more nations were resolved. Whenever governments disagreed, they simply went to war, and when one side surrendered, the problem was solved. All that changed with World War I. Industrialization and technology provided the means to kill on a scale never seen before. It transformed war from a problem solving device into a nightmare. World War I cost up to 15 million lives. The Allied Powers, consisting of England, France and Russia (and their allies), eventually triumphed over the Central Powers of Germany, Austria-Hungary and the Ottoman Empire (and their allies). The carnage was so devastating it was dubbed, "the war to end all wars" ( originally "the war to end war" as coined by H.G. Wells). At the time it was considered a realistic statement, but today it is used mockingly in light of all the wars fought since. The cause is much more complex and difficult to define than that of the Second World War. There was no "focus of evil" as there was with Adolf Hitler during World War II. The bottom line is that the First World War resulted from many of the same issues that ignited the major wars in Europe over the previous centuries; mainly the desire of one or more nations to dominate the continent. The Congress of Vienna convened in 1815 in order to restore a balance of power across Europe after the defeat of Napoleon Bonaparte. For a century the re-alignment maintained a general peace, but it also saw the build-up of armaments to a level that insured the next continent-wide conflict would be a monster when diplomatic relations finally broke down. 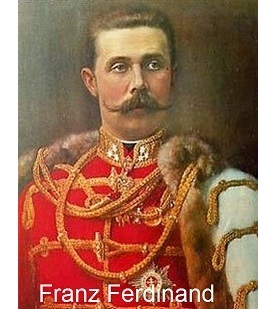 1914: The spark that ignited the war was the assassination of Austrian Archduke Franz Ferdinand on June 28, 1914. On a visit to the Bosnian capital of Sarajevo, he and his wife were shot by Serbian nationalist Gavrilo Princip. Princip was one of several conspirators whose goal it was to shake Austria-Hungary's southern slavic provinces loose and unite the Balkans into a single country called Yugoslavia. They drew their inspiration first from the unification of Italy and then Germany. Little did they know that their action would escalate into a world war. Austria-Hungary issued an ultimatum to Serbia the following month, which Serbia rejected. Austria-Hungary responded by declaring war on Serbia on July 28, one month after the assassination. In order to maintain the balance of power, nations formed alliances to strengthen their hand. It helped keep the peace. The down side was that when one country finally did declare war, it eventually pulled all nations into the fray. And that's how an assassination escalated into a world war. On July 29, Serbian ally, Russia, declared war on Austira-Hungary. Germany came to Austria-Hungary's aid and declared war on Russia on August 1st. One day after that, the Ottoman Empire, which had been secretly allied with Germany, also declared war on Russia. France had a treaty with Russia and declared war on Germany. In an attempt to avoid fighting a two-front war, Germany launched an invasion of France while largely ignoring Russia, calculating that it would take time to organize its army. It was known as the Schlieffen Plan. But in order to cut the distance to Paris, German troops passed through Belgium, a violation of its sovereignty. That triggered a pact Belgium had with Great Britain, which entered the war against Germany. World War I was underway. In the beginning, the participating nations approached it as they had previous wars. With much pomp and circumstance; even revelry. In one of the opening battles, Mulhouse, the French cavalry rode out onto the field in bright uniforms carrying banners in a proud display of patriotism. They were fighting a 20th-century war using 19th-century conventions. Everyone involved would soon be hit by a hard dose of reality. France lost that battle and Germany moved quickly in that first month of fighting in the west; reaching the very outskirts of Paris itself. However, France adjusted its tactics and Great Britain arrived in early September, just in time to halt the German advance at the 1st Battle of the Marne. It was in the waning days of this battle that the war transformed into trench warfare, which would define the nature of combat for the remainder of the conflict. Advancement would be measured in feet, not miles. And in the East, Russia had mobilized faster than expected, forcing the Central Powers to station troops along their eastern borders. An early conflict on that side was the Battle of Tannenberg in which the German army, under the command of Field Marshall von Hindenburg, crushed the Russian army, severely weakening Russia's capacity to wage war. The Ottomans, though they declared war back in August, were late arriving on the scene, not fielding an army until the end of October. 1915: With both sides firmly ensconced in their trenches, the nations began to search for ways to to dislodge them. 1915 was the year that a most horrific new weapon was introduced to the battlefield; chlorine gas. It was at the 2nd Battle of Ypres. The Germans violated the agreements of the Hague Convention (which pre-dated the more famous Geneva Convention) and used the poison on Allied troops. The Allies reciprocated by using gas of their own against the Central Powers. Several different types of chemicals were used to various degrees of effectiveness. By the end of the war the most common was called mustard gas, a sulphur-based poison that blistered the skin and burned the lungs. 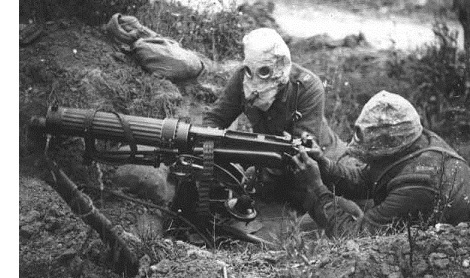 Gas masks quickly became standard issue for soldiers in the trenches. In 1915 Italy entered the war, on the side of the Allied Powers. This was significant because since 1882 it had been tied to Germany and Austria-Hungary by treaty in what was known as the Triple Alliance (Russia, France and Great Britain countered with the Triple Entente). But Italy saw an opportunity to expand its territory at Austria-Hungary's expense and decided to switch sides. In doing so, it argued that the Triple Alliance was a defensive pact and Austria-Hungary was the aggressor, thereby nullifying the treaty. Despite this, Italy's impact was minimal. It attacked Austria-Hungary from the south several times, but was repeatedly repelled. A much more important conflict was playing out in the Dardanelles. The Allied Powers, Great Britain and France were trying to open up a sea route between them and Russia and attacked the Ottoman Empire on the Gallipoli Peninsula. It was a disastrous defeat for the two countries. Great Britain, in particular, suffered heavy casualties from its former colonies of Australia and New Zealand. To this day, the date of the amphibious landing, April 25, is observed as Anzac Day in Australia and New Zealand (as well as other former British colonies in the Pacific), which is the equivalent of America's Veterans' Day. It was such a major failure that it cost Winston Churchill his job as First Lord of the Admiralty (see Winston Churchill above). 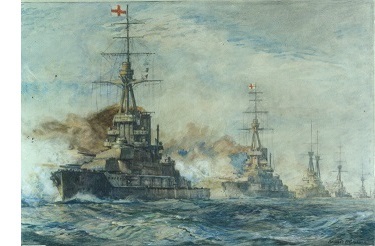 Naval combat played a significant role at Gallipoli, as it had in the war overall. One of the most famous events of the entire conflict occurred on May 7, 1915. A German U-boat fired a torpedo hitting the British luxury liner, Lusitania, sinking it in only 20 minutes. 1200 people died as a result, sparking outrage on both sides of the Atlantic. It was a major contributor to the entry of the United States into the war two years later. The Allied Powers had been using civilian ships to transport munitions, and Lusitania had been one of those ships. So long as this was the case, Germany saw them as legitimate targets. But she also didn't want to provoke America into entering the war. After widespread condemnation, Germany had promised to restrict its attacks to military vessels, but would reverse its decision in 1917. Also in 1915, the first aeroplanes were mounted with machine guns and air-to-air combat began. 1916: In April 1916, Romania entered the war on the side of the Allied Powers. Like Italy, it had been aligned with Germany and Austria-Hungary before the war, but chose to remain neutral at its outbreak. But the Allied Powers enticed Romania to join them by promising it parts of eastern Austria-Hungary which contained large populations of Romanians upon the war's conclusion. The Romanian army enhanced by Russian troops launched an invasion into Austria-Hungary in the summer, but were beaten back at the Battle of Transylvania. The Central Powers countered with an attack of their own and, after a victory at Bucharest, occupied Romania. A year later, Romania was forced to sue for peace when Russia dropped out of the war because of October Revolution. Meanwhile, the largest naval engagement of the war was taking place just off the Jutland Peninsula in the North Sea. Great Britain brought 150 ships, including 28 battleships while Germany committed 100, including 16 battleships to face each other at the Battle of Jutland which waged for two days between May 31 and June 1. The battle was considered a draw, although strategically it favored Britain whose navy stilled ruled the seas. It became the largest naval conflict between modern navies surpassing the Battle of the Yellow Sea a decade earlier (see Russo-Japanese War), and still ranks as one of the biggest ever. 1916 was also the year for one of the bloodiest land conflicts, the Battle of Verdun. It stretched for almost the entire length of the year, from February until December. Germany and France were the only two armies to participate and when it was over, France was victorious. But the cost on both sides was enormous. Out of the 2 million soldiers who fought in it, almost 20% of them were killed. After the loss, by the end of the year, Germany began to seek an end to hostilities. But the allied demands were too punitive and the war dragged on. The Eastern front had its own "Verdun" in the Brusilov Offensive (named for the Russian General who led it). Russia threw over 600,000 men at the Central Powers, and they defended with about 450,000. After a three and a half month campaign the German, Austro-Hungarian and Ottoman armies had to retreat. Verdun and Brusilov were tied together in that the Russian advance forced Germany to pull troops from the West and re-deploy them in the East. Despite this Russian success though, discontent back home was growing over the war which would play a major factor the following year. A formidable new technology was introduced into the war in 1916. 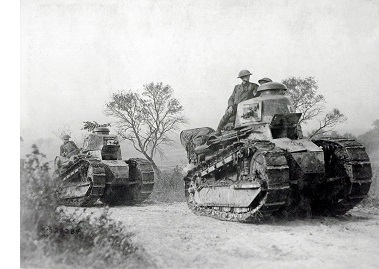 At the Battle of the Somme (a battle almost as bloody as Verdun) in September, both England and France brought tanks onto the field for the first time. The British were first and Winston Churchill played a role in the tank's development. The French tank came shortly after (both were developed independently) and featured the gun turret, a technology in use to this day. 1917: 1917 was a pivotal year for the war, mostly because it saw the entry of one major power and the exit of another. Russia was the country that dropped out due to political upheaval (which will not be dealt with here because it has its own entry on this chart - see Russian Revolution below). The big effect it had was that it turned the conflict from a two-front war into a single-front one. It would be decided in the West. At sea, Britain had been imposing a naval blockade on Germany and by 1917 it began to severely weaken the country. As a result, Germany became desperate and resumed its unrestricted torpedo attacks on enemy ships, civilian and military alike. The country that entered the war in 1917 was the United States of America. President Woodrow Wilson had tried to keep the states out of the conflict for a number of reasons. There was very little appetite to fight on the opposite side of the Atlantic. But more than that, the United States, being a nation of immigrants, most of them from Europe (at that time), there was significant populations from all countries involved and mixed feelings on which side to support. However, ongoing belligerent actions from Germany, such as the sinking of the Lusitania, began to sway American opinion toward the Allied Powers. The event which finally tipped the scale in favor of war was the Zimmerman Note. On January 16, German Foreign Minister, Arthur Zimmerman, issued a coded telegram from Berlin the the German ambassador in Mexico. The note was intercepted by the British government and deciphered by cryptographers. It relayed Germany's intention to try to keep the US out of the war, but in the event that it failed, Germany proposed an alliance with Mexico in which it would help recover lands lost by that country during the Mexican-American War. Germany's goal was to keep the United States tied down and win a quick victory before it could come to England and France's aid. The reaction in America was mostly outrage (however many believed the note was fabricated by the British in order to push America into the war). After Germany resumed unrestricted naval warfare, the United States broke off diplomatic relations. After it received news of the Zimmerman Note, it declared war (on April 6). America's entry had an almost immediate impact. Germany miscalculated the amount of time it would take for the United States to mobilize an army. By the end of June, American troops began arriving in Europe. Russia didn't drop out of the war until December, so there was about a six month period in which the two countries were allied with each other. Even after Russia's exit, fighting continued in the East. Much of the focus turned to the Ottoman Empire which was considered the weak point of the Central Powers (it had been known as the "sick man of Europe" for decades by this time). The Allied Powers, particularly England, attacked through the Middle East. This is the theatre in which T.E. 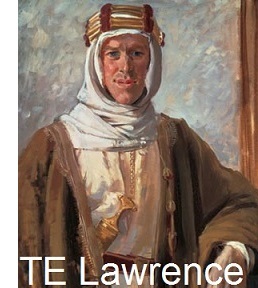 Lawrence fought. In November, Great Britain defeated the Ottoman Empire in the important Battle of Jerusalem. The Central Powers were now clearly on the defensive. 1918: Though the war would drag on for most of 1918, it was already winding down. Woodrow Wilson drew up his Fourteen Points for a post-war peace in January. However, there was still a lot of fighting to do. Germany made a last desperate attempt to win the war. General Enrich Ludendorff developed plans for Spring offensive intended to divide (and conquer) the British and French armies. He wanted to launch it before the American army reached full strength. The attack was initially successful, the German line coming within 75 miles (120km) of Paris. Close enough for Germany to unleash its most powerful weapon, a gun nicknamed 'Big Bertha' (although technically this name referred to one specific type of howitzer). However, the offensive stalled by summer. The Allied Powers countered with an offensive of their own, known as the "Hundred Days Offensive". It would prove to be the decisive campaign. Starting with the Battle of Amiens, it concluded with the expulsion of Germany from France and its eventual surrender. The commander of Amiens was General Henry Rawlinson, the son of Dr. Henry Rawlinson (the "Father of Assyriology"). One of the final attacks of the war was the "Meuse-Argonne Offensive". This was the American wing of the Hundred Days Offensive. It was this battle in which Sargent Alvin York (a distant relative of mine) single-handedly forced the surrender of 132 German soldiers. The Central Powers officially surrendered on November 11, 1918. Both sides had been devastated by the war, but Germany was particularly hard hit. Great Britain's blockade caused widespread starvation among the civilian population. Despite this, the Allied Powers held the Central Powers responsible and wanted to make them pay. France, in particular, intended to impose harsh terms on Germany as punishment for its loss in the Franco-Prussian War forty years earlier. The terms of surrender were outlined in the Treaty of Versailles, which Germany was compelled to sign, but the United States refused to. President Wilson advocated a "peace without victory" settlement, and Prime Minister Lloyd George feared the consequences of such harsh terms. One of Wilson's Fourteen Points was the establishment of a "League of Nations" which was intended to bring the nations of the world together in order to prevent future wars from occurring. It was unsuccessful, of course, since the Second World War broke out two decades after the conclusion of the first.